Boss Craig Denton is lifted aloft as Tigers celebrate title win. Pic credit: Mike Holmes. A proud Craig Denton heaped praise on the “special” group of players, staff and fans of Worksop Town as the Tigers sealed the NCEL Premier Division championship with a 4-0 win over Albion Sports. Saturday’s triumph - a 16th consecutive league win and 18th including cup competitions - brought jubilant scenes at the final whistle, as Worksop secured a return of Evo-Stik football to Sandy Lane next season. 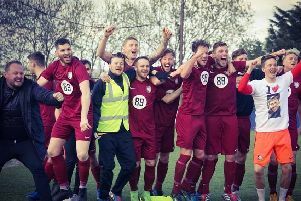 Their impressive run stretches back to January 15th and a come from behind 3-1 win away to Thackley, which saw Matthew Sykes strike twice in the final five minutes to clinch what would be the first in a memorable run. The same player got the ball rolling on Saturday, from the penalty spot, before Steven McDonnell, Lee Hill and Sykes again put Tigers into an unassailable lead at half-time - and one which left Denton brimming with pride. “It’s amazing,” he said. “Full credit goes to the players who have been involved this season – the lads who don’t make the 16 or come on as a sub, everyone is involved. “The group of players we have got are really special, which is testament to their passion and desire, and to wanting to play for the football club and get this amazing run, which got us those points to get the league title. With hopes high, Denton admitted to there being mixed feelings of excitment and nerves in the camp in the days leading up to the match at Albion. And he revealed the simple message he had for them. “We told the players that you need to enjoy it,” he said. 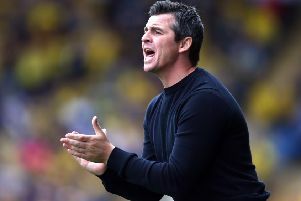 “But I know the lads were just focused on getting those three points and I know the crowd wouldn’t faze them as they just stand up and be counted, and have done all season, especially in this hard run-in. “Everyone’s dug in, I think we have controlled the game during the full 90 minutes and it could have been 5-0 or 6-0. And he reserved special mention for the supporters.